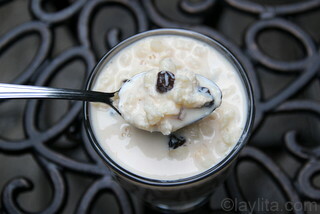 Morocho, also called morocho dulce, is a thick sweet drink made with morocho corn, milk, cinnamon, sugar and raisins. 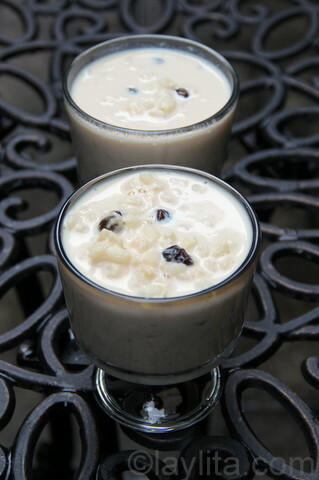 Morocho is a classic Ecuadorian comfort drink and is primarily sold on the streets or at markets. 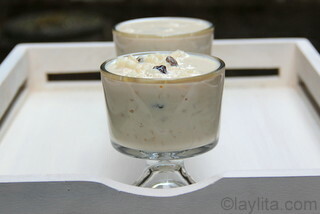 The consistency is similar to a pudding milkshake and you can usually eat it with a spoon. This recipe has been one of the most requested recipes that I’ve received and I am very glad to finally be posting it. The biggest challenge I’ve had with making this drink, is that for the longest time I couldn’t find the right type of corn to make it in the US. Morocho corn is a type of dried cracked hominy corn that you can now find in Latin grocery stores. This type of corn is also used to make a delicious soup called sopa de morocho and the famous empanadas de morocho. 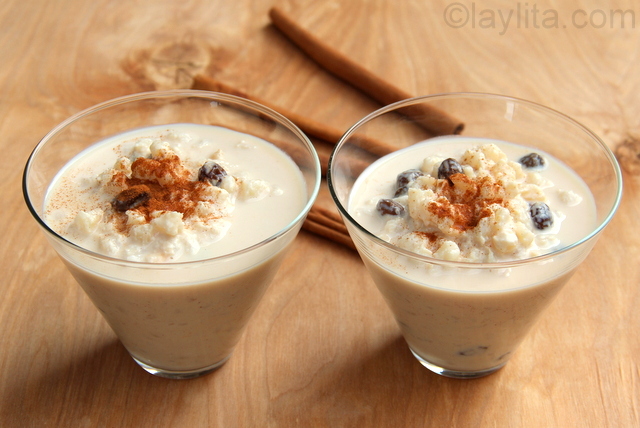 Morocho is a thick sweet drink made with morocho corn, milk, cinnamon, sugar and raisins. 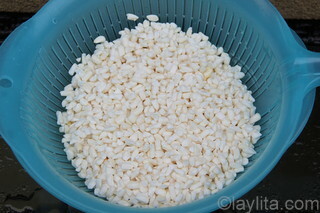 Soak the morocho corn overnight in 6 cups of water. 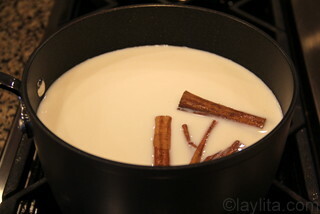 Place the morocho corn, cinnamon sticks, and the 8 cups of milk in a pot. Cook on low temperature until the corn gets very soft and tender, about 3 hours. Stir every once in a while to keep the corn from sticking to the bottom of the pan. Stir more frequently during the last 30 minutes. Add the sugar and the raisins. Cook for another 15-30 minutes, stirring frequently. Serve warm and sprinkle ground cinnamon on top. 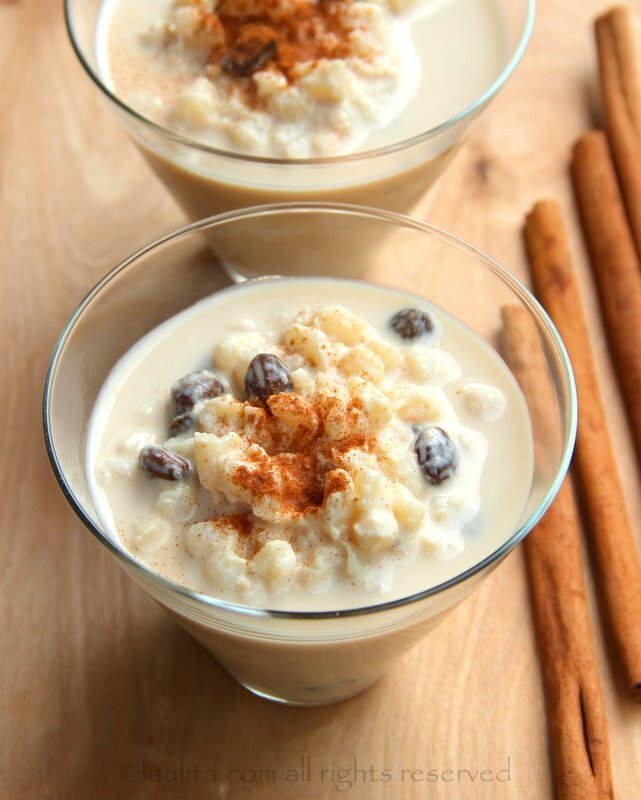 At first glance this drink almost looks like the well known arroz con leche or rice pudding dessert, and the process for preparing it is quite similar. 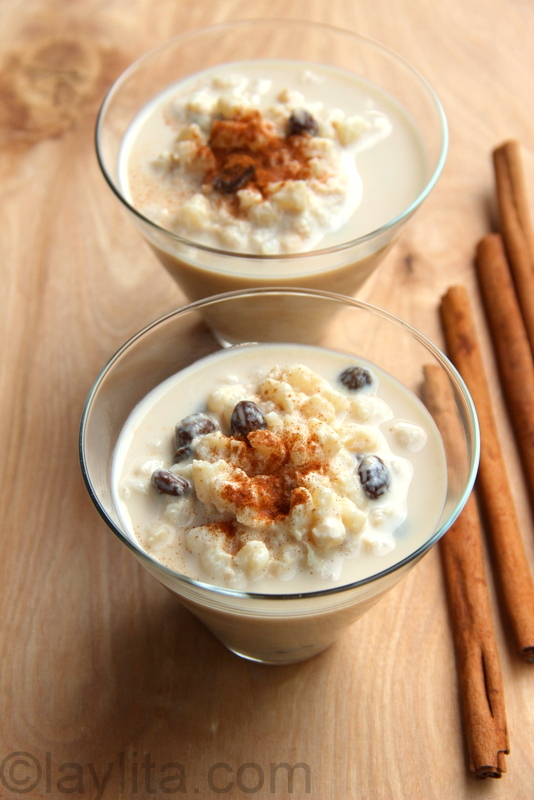 Morocho does have that delicious milky cinnamon flavor that arroz con leche has, but the corn also lends its own flavor to the drink. 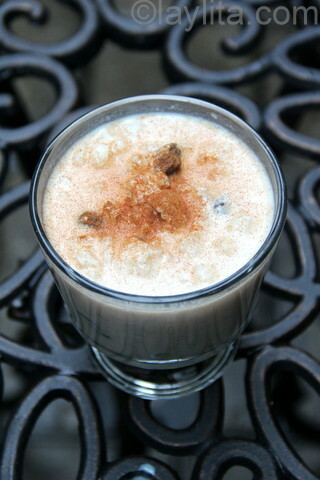 You can enjoy morocho for breakfast, it also works great as an afternoon pick-me up, or can even be served as a dessert. Morocho is made by simmering the corn with milk and cinnamon until the corn is very tender, you can also do the quick version preparation by cooking the morocho corn with water in a pressure cooker, and then cooking it with the milk. If you have time it is much better to cook it directly in the milk, you will also need to add less sugar if you cook the corn in the milk as the milk reduces and naturally sweetens the drink. Drinks and desserts in Ecuador tend to be very very very sweet, I was used to it when I lived there, but this last visit I realized that I prefer a little bit less sweetness. As a result I use a lot less sugar in this recipe than they put in the morocho that they sell on the street, so feel free to adjust the amount of sugar based on your preference. Raisins are included sometimes and can be added if you like them. Being if Ecuadorian decent, I’ve never been to Ecuador but my mom always cooked Ecuadorian food and when she passed away I was sad to think I would never be able to eat the amazing food again. I have started cooking and stumbled onto your site, thank God. I plan to cook your recipes. Thank you for sharing. Layla: Thanks a lot for linking to our Brazilian variation of this corn pudding. Your Ecuatorian version looks super delicious!!! un placer comunicarme x este medio, te queremos y gracias x tu enseñanza. 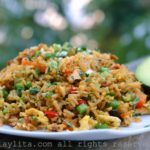 Esperamos q salga un libro de cocina Laylita….con mucho gusto para comprar. Hi Layla, I saw this on FB and had to jump over to your blog for the recipe. I’m posting to my “must make” Pinterest board so I can try this soon! I’ve been reading your recipes so often after coming back from study abroad in Ecuador. I fell in love with the country and have returned twice already and plan on returning again soon. All of your recipes has really been a great way to cure my reverse home-sickness, thank you so much! I have a question, morocho was one of my favorite drinks that my host-mom would always make me and wanted to make it here in Los Angeles to share it with my family. Problem is, my dad is lactose intolerant. Would it be possible to make this with soy milk? I am afraid it would ruin the taste. Hi Sophia – You could try to make by boiling/cooking the morocho corn with water first (instead of milk), it will cook faster. 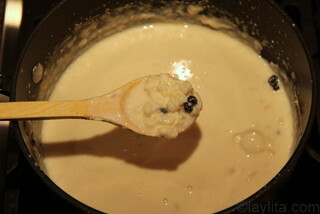 And then once the corn is soft, you can add in a non-dairy milk at the same time as the sugar and raisins. I think that almond milk or coconut milk will be better than soy milk – the taste will still be different than the original, but the almond or coconut flavor will still result in a tasty drink/dessert. Great! I will try with some coconut milk thank you so much Laylita! Super rico……la mayoria de las personas que pregunto dicen cocinar en agua hasta se evapora y metes la lache despues. Creo que cocinando en la leche con canela le da mas sabor. Yo también añado pimiento de dulce que pienso le da mas cuerpo. Gracias! Excelente! Tal como lo recuerdo! Gracias. Hoy prepare el morocho, que delicioso me quedo. 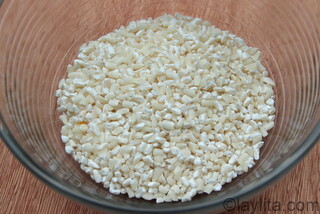 Can I use coarse ground hominy, and just assume a sorter cook time? Hi Phillip – I haven’t tried, but the little pieces of cracked corn shouldn’t be too small, part of what makes this recipe traditional is having those little chunky bits of cooked corn. Se ve delicioso y creo que lo voy a tener que hacer…Una receta muy especial. 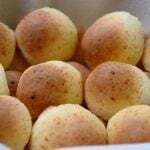 Laylita, muchas gracias por esta receta. Una pregunta el mote que conseguiste es el de goya, veo que lo venden en amazon, si uno lo consigue entero si uno mismo lo muele queda bien? y otra pregunta que marca de ollas usas, se las ve muy buenas y no he tenido suerte últimamente con las ollas. Muchas gracias por tu generosidad y creatividad! Aun no he intentado hacerlo con el maiz entero, pero me imagino que si lo mueles o lo trituras (tal ves en un procesador de alimentos) puede resultar bien. Las ollas mas recientes (una de las cuales esta en la foto debajo) es de la marca Bialetti y consegui el set en Costco. Un buen recuerdo de Ecuador para hacer en esta epoca. I always appreciate the photos that you use for your recipes. Your recipes are very good and well written so they are easy to follow but your photos make them even better. You have a good eye.